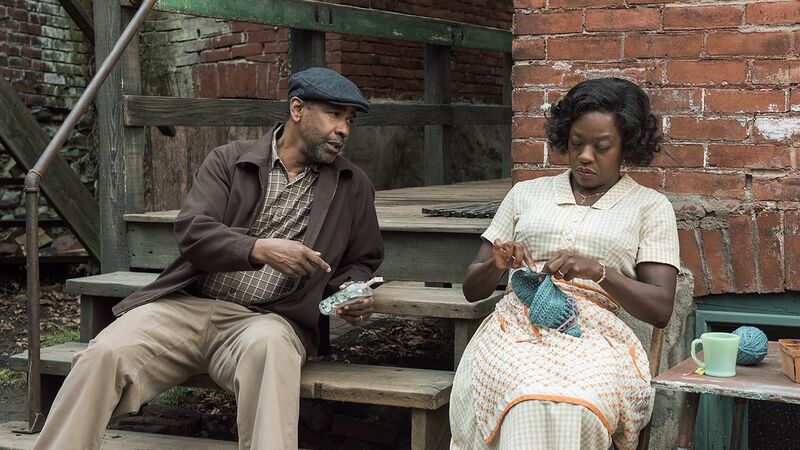 Denzel Washington once again steps behind the camera to direct himself in Fences, a film based on the play both he and co-star Viola Davis are no stranger to. And unfortunately, this is the greatest problem with the film. 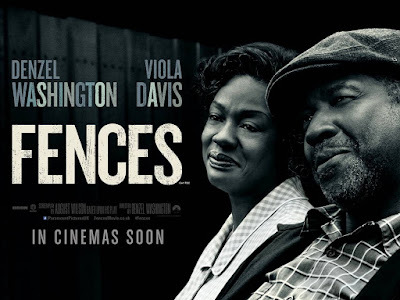 Despite knockout performances by both Washington and Davis, Fences commits the ultimate stage to screen crime...it is obvious. The most successful stage to screen adaptations make people oblivious to the fact that it is an adaptation. In hindsight, Washington would have seemed the obvious choice to direct and August Wilson the perfect choice to write the screenplay, as he also wrote the Pulitzer Prize winning play. Yet, these are perhaps the two biggest downfalls of the film. "Some people build fences to keep people out, and other people build fences to keep people in. " Washington's Troy Maxson is an ex-baseball player who despite his sunny outlook on life, is tormented by his past misfortunes. His wife of 18 years, Rose (Viola Davis) has been his tower of strength, but his son, Cory (Jovan Adepo) has felt his wrath more than his love. The family has always kept a strong and happy united front, until Troy brings home an issue from outside their walls and the cracks star to show inside. Despite the fact that Fences has one major problem as a whole, it does have incredible redeeming features. It is a well-made film, but would have worked better from an entertainment perspective if it didn't look like a play trying to be a film. It is a challenge for a writer to adapt a play for screen and make it seem as though the story was originally made just for this medium. Many films are able to do this well ( eg. The Philadelphia Story, Chicago, Les Miserables, etc. ), but Fences cannot hide this fact even though you can tell Wilson's screenplay has tried to. Both director, Washington and Wilson are far too attached to and know too well what works from their previous work on Broadway with Fences. The result is that the film is slow, overlong and lags under the weight of the heavy chunks of dialogue, even though these pieces are delivered brilliantly and are wonderfully written. While the film doesn't have a wide variety of filming locations due to the nature of the story, it's production design by David Gropman is superb. Fences is wonderfully nostalgic with it's recreation of 1950's Pittsburgh. The time period is replicated beautifully in it's set design of the Maxsons street and house, and with Sharen Davis' costume design. However, it is the performances by Denzel Washington and Viola Davis that are the champions of the film. Washington directs himself wonderfully, but one can only imagine that it would not be such a hard task as he has played the role many a time before. His Troy is a particularly interesting character, as he continually battles with his inner demons who are tormenting him about his past and missed opportunities. He is particularly likable at the beginning of the film and becomes harder to like as the film progresses showing wonderful character depth and development. Washington is certainly powerful and undoubtedly perfect in his role, but it is Viola Davis as Rose who is the greatest thing about the film. Even though Washington is a force to be reckoned with, Davis steals the spotlight away from him in every scene she is in. She is such a strong female character who struggles with, but does not give up on her job to keep her family together. With the Academy Awards only two weeks away, Davis is an absolute certainty to win the Best Supporting Female Actor Oscar for this role. There is one scene in Fences where if this had been the only scene that Davis had appeared in throughout the film, it would still win her the Oscar. Fences is a fine looking film, but is ultimately saved from itself by it's powerful and memorable performances by it's cast.